We had planned to go for the 2-river 4-lake tour at 8pm on our first night in Guilin. Since it was still early, we had walked around the huge Central Square and busied ourselves snapping photos. After that, we crossed the bustling Zhongshan Road to the opposite side where a few shopping complexes were situated. It was time for dinner and we decided to look for restaurants inside one of these shopping complexes. 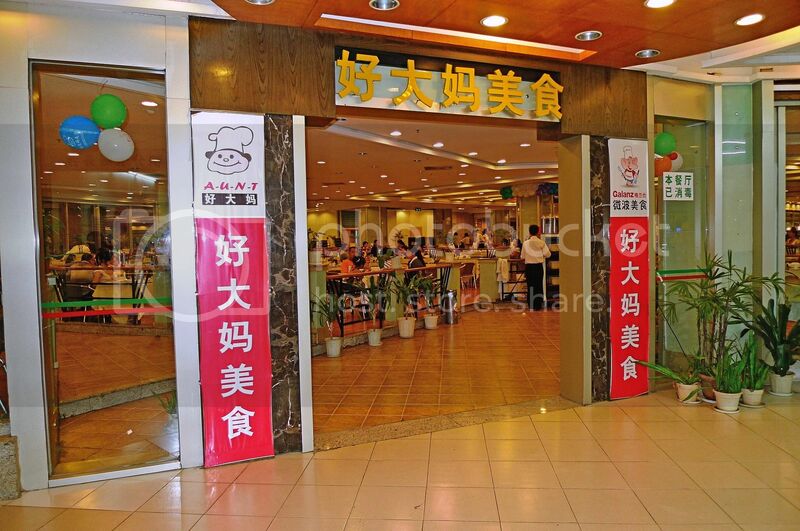 We chanced upon Hao Da Ma Restaurant ( 好大妈美食) on the 6th floor of Niko Niko Do Plaza (aka Weixiao Tang 微笑堂 ), the largest multi-storey shopping mall in Guilin. 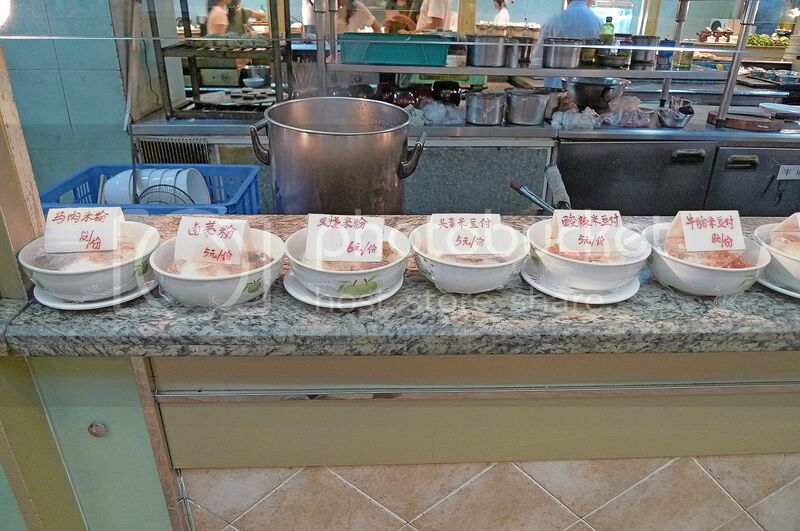 There were a lot of stalls located in the middle of the restaurant where you could select and order the food you want. They would cook the dishes you ordered and deliver to your table. 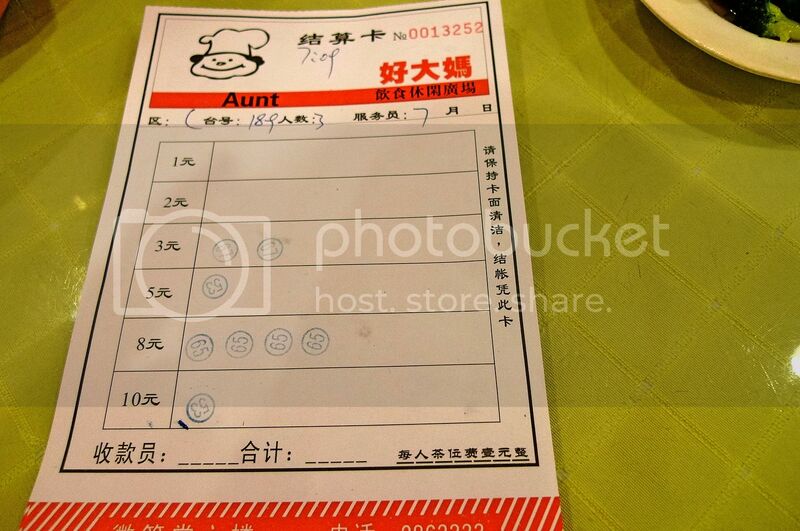 Once your food is delivered to your table, it is recorded with a chop on the corresponding column as shown below. 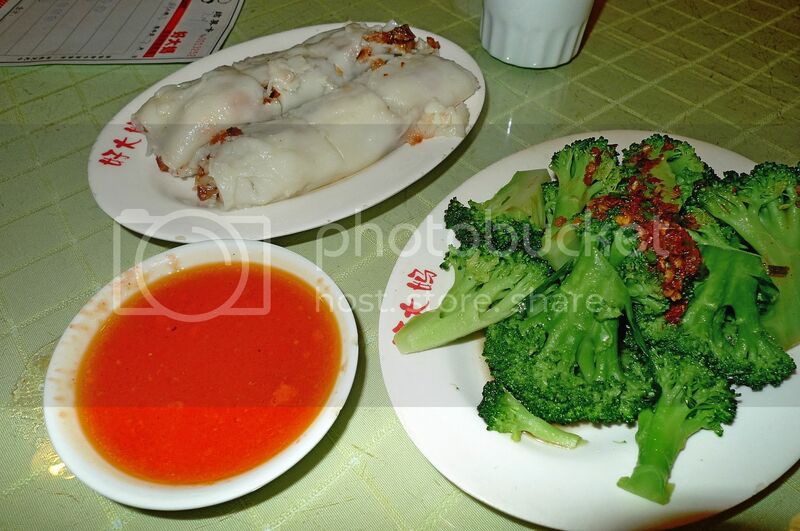 We ordered cheong fun and broccoli. And some meat dumplings to be shared among the three of us. We walked around searching for the main dish for each of us. Then we saw this. 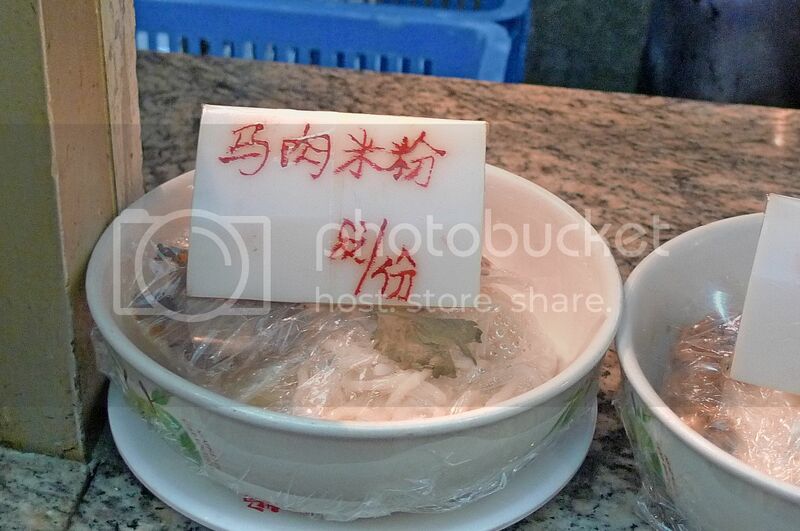 We zeroed in on this - horse meat rice noodles (马肉米粉)!! Yes, horse meat! So each of us ordered one bowl of horse meat rice noodles. 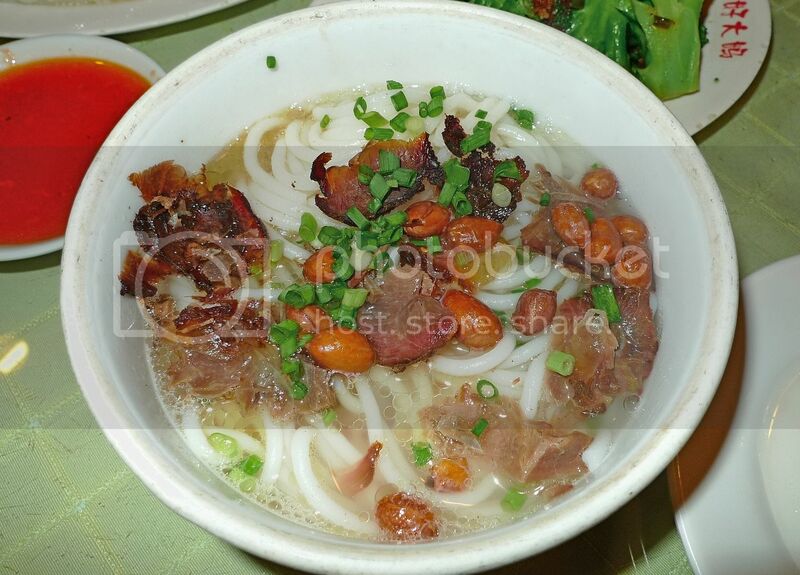 Rice noodles is a very common dish in Guilin and I would be eating quite a lot of rice noodles during my stay here. The bowl of noodles usually comes with fried peanuts which I thought was very strange at first, but I soon found out that the peanuts really enhance the taste of the noodles! The pieces of meat you see there are of course horse meat. It was my first time eating horse meat! But I really did not find it that unique or different from other types of meat. Our dinner came to about 18 yuan (RM8.50) per person. Not bad at all! After dinner, we got stuck in a long queue at the lift. I realized it was past 7.30pm. We had to make our way to the Li River banks fast for the 2-river 4-lake tour! We crossed the road and reached Central Square. But something happened! Somehow we could not find our way to the Li River banks from Central Square. It was almost 8pm. After walking for some time, we realized we were back at Central Square! Oh no!! Did we make it for the tour? Find out in my next post, coming right up! Wah I've never eaten horsey!! Oh I love peanuts in my noodles actually Foong! Like in soto.. yummy! d broccoli with sambal is it??? so weird one? So the horse meat tastes like beef? I bet it must be gamey. After you eat the horse meat, do you run like a horse, sound like a horse? so that 好大媽 is something like a foodcourt?? 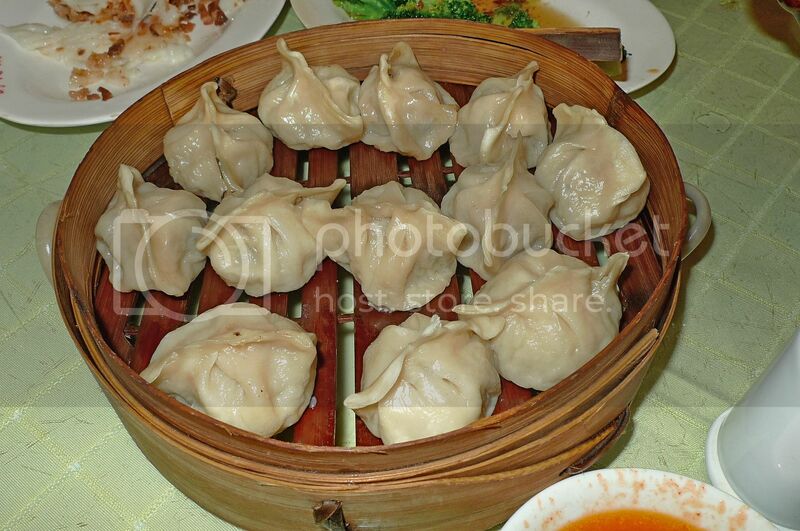 but from the way you order food, it's something like eating dimsum..
and the food is quite cheap i think, starting from RMB1 and the most expensive is only RMB10.. and the bill at RMB8.50 is definitely cheap..
actually i'm gonna ask, how much is that basket of dumplings?? there are a lot of dumplings in it!! you finish that all by yourself?? so how does horse meat taste like?? 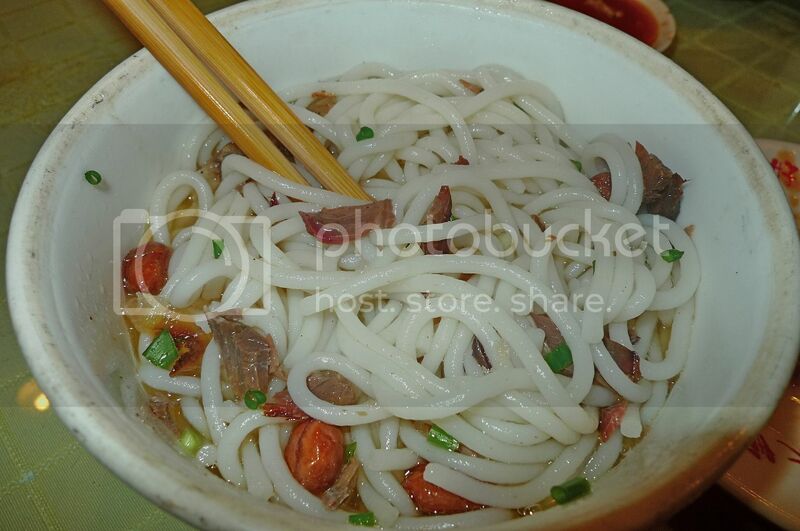 looks like beef to me in the photo.. and could tell it's horse actually..
hey, i like that kind of rice noodles.. don't think we can find it in malaysia.. if not mistaken, it's the popular speciality from guilin right?? When I was in Guangdong many years back, there was an occasion when the restaurant served dog meat. But I insisted on not eating it. so what is the sound of a horse? The food looks great. Did they taste just as good? That bowl of rice noodles reminds me of the beef noodles at Lai Foong. Horse meat? hmm..
A river cruise at night? Looking forward to the post. mariuca, congrats FC!! Oh yes, now you reminded me of peanuts in soto! Haha! Maybe because I always associate noodles with the chinese noodles I always eat! caroline ng, huh? Where got sambal? Broccoli only. mei teng, yeah not much difference between horse meat and beef. SK, what? Fitness First? Haha! Now you mention, I thought they look quite similar but on closer inspection, not really lah. Haha! Yeah something like a food court and we have to go to the stalls to order then go back to our tables. Err...I am not sure what is 過橋米線! But yes, the rice noodles are quite nice though I don't think I can eat it everyday! Yeah, can't find it in Malaysia. khengsiong, haha yes chinese eat everything with four legs, not me though! isley chang, I already kedekut before eating the horse! Hahaha!! eugene, you eat cow? Then you can eat horse! LOL!! kelvin, if the horse meat in huge slices, then it won't be as cheap as this lah! LOL! Wah....suspend again? Quick quick tell us the story. Peanuts with noodle is just like soto... delicious. bro, u r the first person i know who eaten horse meat....grrr...nice ah? i wanna eat crocodile meat ler...but exp here. I have never tried eating horse meat. Is that really good? Oh No! Did you make it on time? Did you? Did you?!!! u ate horse meat but i ate kangaroo meat in Australia. i ate horse meat before... horse satay. the meat was too hard! vialentino, haven't tried horse meat and you want crocodile meat? LOL! faisal, horse satay! Wow! Where you ate that before? merryn, you can eat a cow, why not a horse? Haha! But yes, it's very cheap though I did not eat a whole horse of course! LOL! i don't think i can ever eat horse meat no matter how delicious it is. Anyway 1 tried is enough eh. ewww i don't think i could ever eat horse meat!! so cheap huh..RM8.50 per person! Horse meat, at night when sleeping got after effect, neigheeeeeeeee! ha ha ha! Run 100 metres race sure win,,,ha ha ha! Tasted gamey? Like beef .... or more like ostrich? I just want to know 'cause I have eaten Montreal Smoked Meat once and am a complete horse lover who has been riding for 4 years! Just wanted to see if I could proudly say that I have never eaten horse meat. I personally believe that its simply a question of cultural differences and I am not sure why it would not be ok. After all, they sell goat and camel meat in my city, and no one freaks out about it. Wow that's a cool news. Congrats for it. The restaurant and the images of food are quite interesting but I wished that it was not made up of horse meat so that people like us also could try them who are not horse meat eaters like you.. I think this is the first time you had horse meat and so you are so excited. I don't have a similar experience and nor do I want to. But the restaurant is attractive with brilliant decoration inside. Thanks for the post. Bye. My horse tasted even better then when I took a trip to a southern east asian country and ate some dog meat soup. All Horses should be eaten or enslaved but not kept as pets. I can't blame other countries and cultures for consumption of horsemeat- I can only work towards stopping that from happening here at home.